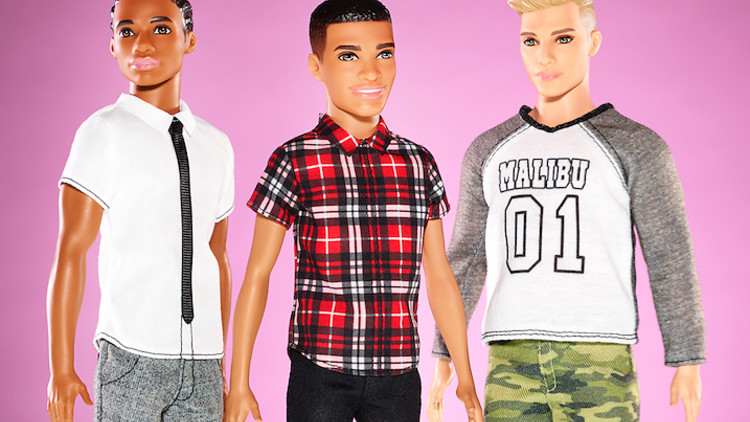 Following Mattel’s radical transformation of the iconic Barbie doll, Mattel are now offering 15 new additions to its Ken Fashionistas line to include slim and broad body types and feature a range of skin tones and hairstyles. In their attempt to keep up with the demands of the modern world, the need to redefine the aesthetics of a Barbie or Ken doll is paramount. Therefore, ‘”evolving Ken was a natural evolution for the brand and allows girls to further personalise the role they want him to play in Barbie’s world”, states Lisa McKnight, senior vice president and general manager at Barbie. Certainly, the evolution of the Ken doll has far more implications than aesthetics. The Barbie/Ken phenomenon has become a reflection of our culture, and translates the ideas that have both shaped and shifted society. So, given that the collection of Kens will now consist of three body types, seven skin tones, eight eye colours and nine hairstyles, the future is diverse! To celebrate this, Machine-A have created a Ken retrospective range at their London store, Brewer Street, designed exclusively by Martine Rose. Alongside this, an archive of Ken dolls will be mounted until July 7th, including the 1991 MCHamer Ken, a 1981 Sunsational Malibu Ken, as well as a 1982 Dream Date Ken, and more. Rose has revamped a 1968 image of Ken on a unisex long-sleeve T-shirt, which will be sold along with the revamped Ken dolls at Machine-A until July 6th at 13 Brewer St, London.